LOCATION LOCATION LOCATION - one of the most desired streets in West Dover!!!!!!!!! This 5 bedroom, 3.5 bathroom, three level home is located just three minutes and a little over a mile from Mount Snow, eight minutes from Haystack and a minute from the Mount Snow Golf Course making it the perfect choice for all vacationers during all seasons of the year. 1st level has (3) bedrooms and (2) full bathrooms. There is also has a bunk area perfect for kids! 2nd level includes two oversized family rooms with fireplaces, pool table, shuffleboard, game room and plenty of room to relax after a long day on the slopes. This spectacular house also has a large kitchen with a table that can hold at least 14 making the kitchen great for dining in or family gatherings. 3rd level has (2) bedrooms and sleeps up to 9 with one full bathroom. This house is great for a large family and groups and kept clean and tidy by the owners. The house is within walking distance to local area restaurants / bars and 7-11 convenient store. There is a new bike trail for walking and biking at then end of our property making walking convenient to a number of desired local attractions. One of the biggest compliments we receive as owners is the location and access to the local hot spots. Driveway is large and spacious allowing for outside activities including using the fire pit if desired. Sno mobiles are welcome with the house offering easy access to the VAST system at the end our road. Propery is well maintaned by the owners and family. We have been traveling to the Mt. Snow area for years and eventually ended up buying a house close to mountain for our family. Location - Our location is great for the tenants because you can walk to a number of local bars / restaurants and 7-11 is about 300 feet away. We also have the golf course and nature trail at the end of our street for snowshoeing hiking. The shuttle (MOOver) picks you up at the end of our street and drops you off at the base of the mountain (about 1.5 miles). GREAT PLACE FOR A NICE GETAWAY WITH A MORE THAN PERFECT LOCATION. WE WERE A GROUP OF 15 WITH 7 KIDS RANGING 2-8 YRS. PLENTY OF ROOM TO SLEEP APPROX 16-17 AND THE KIDS HAD A BLAST RUNNING AROUND THE PROPERTY. THE PROPERTY HAS SOMETHING FOR EVERYONE. KITCHEN IS DATED AND ALTHOUGH WASHER/DRYER IS AVAILABLE ONLY WASHER WAS WORKING. IT WAS 45 DEGREES OUTSIDE WHEN WE VISITED SO A WORKING DRYER WOULD HAVE BEEN GREAT. THERE IS A 24/7 7-11 STORE WITHIN WALKING DISTANCE FOR ALL ESSENTIALS. THERE IS ALSO A TOWN PARK/PLAYGROUND ABT 1 MIN WALKING DISTANCE. WE HAD A GREAT TIME AND OWNER KEVIN WAS GREAT WITH COMMUNICATION. FALL COLORS WERE GREAT AND WEST DOVER HAS AN AMAZING SMALL TOWN FEEL. WAITING TO GET BACK NEXT YEAR. We went up for our annual ski trip with around 14 people. The house fit us all comfortably with room to spare. Our group especially enjoyed the game room and hot tub!! House is close to Mt Snow and walkable to a few bars/restaurants and convenience store. Stayed with a group of 14 adults at Kevin’s place in Vermont for a ski trip. Kevin was very helpful and responsive during the booking process and pre-trip. During our stay everything was in great working order and the house was clean and spacious. Everyone loved the hot tub and game room. Kevin even texted us during the trip to ensure that all our needs were being accommodated. The location can’t be beat ... 5 minutes drive to the mountain was great! This house was excellent! Around 18 of us stayed here over the MLK holiday weekend. The house was incredibly spacious, with plenty of room to fit all of us comfortably. The large kitchen, game room, living room and numerous bedrooms were all amazing, comfortable, and clean! What makes this house extra amazing is that it is within walking distance to the restaurants and 7/11 down the road. We really enjoyed staying here and will definitely be back next year! Perfect ski house - close to the mountain! Though the snow in early March this year was not the best, our group had a wonderful time up in Mt. Snow staying at this house! The house easily and comfortably sleeps large groups and has great amenities such as a pool table, shuffleboard table, hot tub and fireplace. One of the best parts of the house is its proximity to the mountain - it's about a 5 minute drive! It's also walkable to a bar down the hill and a 7-11. This was our second year renting the house and we'll definitely be back! Great house for a big family ski trip! Our family rented this house over Christmas break for 13 people plus various visitors and it was perfect - exactly what we were looking for. 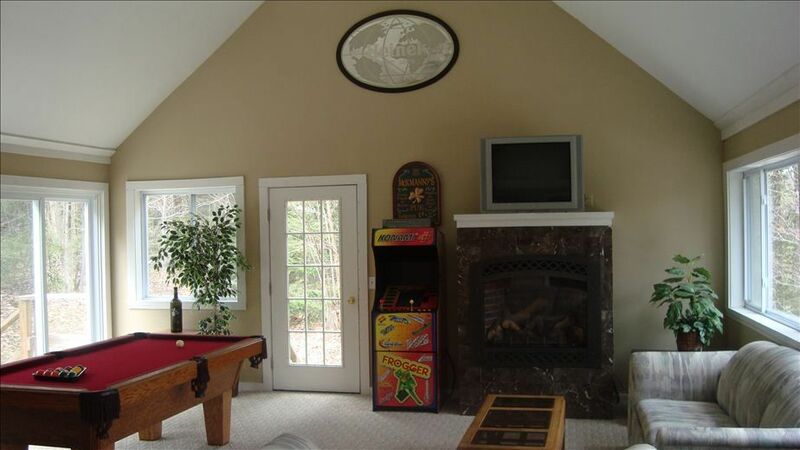 The kids spent hours in the game room playing pool, board games, and watching TV, alternating with trips out to the hot tub and rolling around in the snow outside. The house is worn just enough that we weren't following the kids around with brooms and dust pans but not so worn that we didn't want to get comfortable. As head chef, I can say that the kitchen was equipped to handle cooking for up to 24 guests (although a new coffee pot is probably in order!). It was really key to have the expandable kitchen table plus pub table in the game room for our Christmas dinner. All of the beds were comfortable and the linen service was great - we never needed to worry about clean towels or sheets. The location of the property was also key - we were close enough to walk to the convenience store and some restaurants, and very close to the mountain. It was also really easy for visitors to find. The owner of the house was very engaged and responsive and helpful in a lot of ways as we were getting set up in the house and also as we were leaving. We had a missing item and he went out of his way to help us find it, which we appreciated a lot. Everyone was raving after the trip about how much fun it was to have the house and what a great find it was! If we visit Mt. Snow again we will certainly consider this property again!